We recently purchased a new sofa for our family room and we are loving it. We don’t have a large budget for these type of items. Usually our process consists of us selling a piece of furniture in order to purchase a new piece of furniture. I know we can’t be alone. When we finally decided to get serious about getting a new sofa I started doing some inspiration searching. I love the newer feature on Instagram where you can save images to your little hidden feed because I was able to see a ‘theme’ amongst my saved photos. You want to know what that was?! It was a white sofa. Can you even handle? 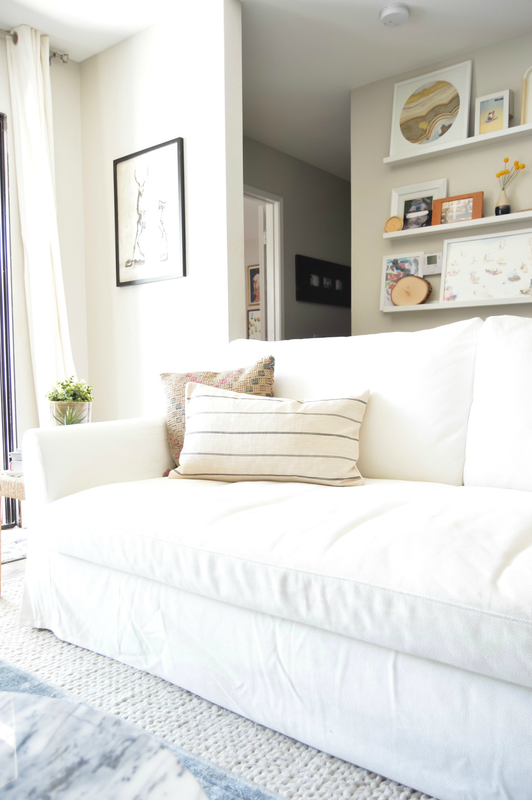 Was I crazy to get a white sofa with two kids and a dog? 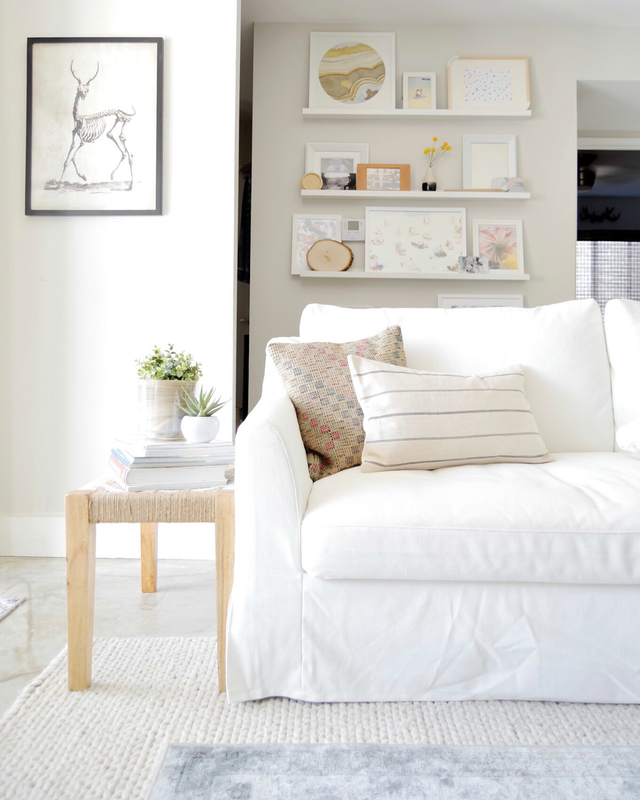 I consulted with a few of the Instagram owners of these white sofas that I loved and they all said to go for it, that I wouldn’t regret it. I officially made my decision to go white and that began my search for the sofa with the best lines and the best price tag. This is where Ikea entered the equation. They had recently released the Farlov collection and I fell for it hard! I loved the single seat cushion, the two big back pillows and the arms have a real simplicity to them, but just enough movement too. And bonus, its slip covered, so no worries of spillage. I haven’t had to wash the seat cushion yet, but I am getting close. I’ll report back once I do wash it. Comfort wise, we are so happy with it. The seat is nice and deep making it a total lounger sofa. We haven’t had one for almost 4 years! It was so nice to almost fall asleep watching tv the other night. LOVE it! I have actually heard that IKEA slipcovers are super durable! Do you mind me asking you where you got your bottom rug from? Is it pretty durable? Hi Jamie!! It is from Rugsusa, its their braided textures rug. It is 100% wool so it does snag some in the high traffic areas. I've had it for 4 years though and I still love it. So glad to hear you love it, its on my radar. My motto for upholstery is the very best you can afford or IKEA inexpensive. Have you washed it yet? I'm about to place an order for the sofa and love seat but there are no reviews! I'd love to know how it does in the wash since I have three boys a dog! Love love love this sofa. Can you tell me how the sofa was packaged? I am going to drive to go pick one up 3 hours away but I am trying to make sure it will fit in my vehicle. Do the legs unscrew? What vehicle did you use to transport it to your house? Thanks! Hi Molly… You actually assemble the sofa, so yes, the legs are not screwed in yet, nor is the back attached. It was in two large boxes if I remember correctly. We used a pick up truck without a shell so we had no issues.